NHS Highland have teamed up with Stagecoach to offer employees a reliable choice to their daily commute. NHS staff in the north are being encouraged to use public transport to help them stay active and save money. 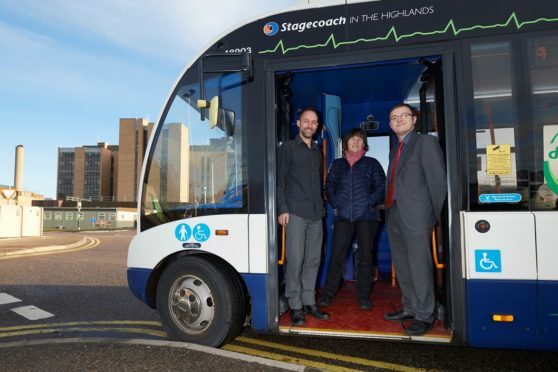 NHS Highland has teamed up with Stagecoach to offer employees across the board a 10% discount on all services in and around Inverness to encourage them to consider alternative modes of transport for their daily commute. The discount will be activated when purchasing seven day megarider tickers online and through the app for zones one to four, covering the city centre as well as areas including Brora, Elgin, Fort Augustus and Tomatin. Dan Jenkins, health improvement specialist at NHS Highland, said: “We know that finding a parking space can be a real problem for staff at Raigmore Hospital and at some other NHS Highland sites. This causes stress and wastes staff time. “Choosing to use the bus cuts down on parking demand, reduces local air pollution and carbon emissions from multiple cars and helps meets the needs of people who cannot or choose not to own a car and drive. The scheme has been developed by the Active Travel Engagement Project, a partnership between NHS Highland and Sustrans Scotland to help staff become more active and sustainable on business journeys. The new initiative is being trialled until the end of April, a review will then be carried out. Daniel Laird, commercial director at Stagecoach North Scotland, said: “This discount covers Inverness and the main commuting area around it.